I have a love/hate relationship with make-up. Now before I go on, this post may bore some people. In which case, I direct you instead to YouTube, and this clip of Charlie Brooker discussing the staggeringly terrifying yet awesome American TV show Deadliest Warriors. For those who may be interested, I'm about to do something I don't think I've ever done on girlclumsy.com before - a product placement. 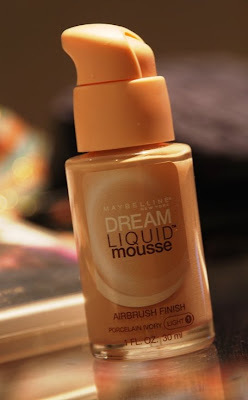 This is Maybelline Dream Liquid Mousse Foundation. I bought it about a month ago, and can honestly say it's the best foundation I've ever used in my life. As I said, I have a love/hate relationship with make-up. I love buying foundation and putting it on - but I cannot bear wearing it most of the time. I rarely wear foundation to work - thankfully the radio medium allows me to get away with just SPF 15, or the occasional dab of tinted moisturiser. I always feel like make-up is an after dark/special occasion thing. For me, it's also a "performance" thing. Obviously theatre work requires make-up; but it's a rare day indeed that I don't put the slap on for improv shows. It's a ritual of preparation - donning the "mask", if you want to get deep. I'm not deep though, and will readily admit if I feel attractive, I'll generally go into a show more confident. Despite no real need for large volumes of foundation, I can regularly be found wandering glassy-eyed through Priceline or the beauty aisles in Target, trying on different foundations, rubbing them into my jawline and staring into the tiny smudged mirrors they stick on the side of the cosmetic shelves to see if the colour matches my pasty face-skin. I've used Maybelline foundations before; they were all right, like most foundations are. I tend to use lighter foundations, because I loathe the "more is better" philosophy that some women seem to cultivate. In fact, if any of you ever spot me with a visible make-up line around the chin, and those scary sticky heavy eyelashes, you have my permission to go me in the face with a shammy cloth and some Easy Off Bam. I found Maybelline's initial range of Dream Mousse foundations very gluggy and uneven in texture, but boy have they improved out of sight with this Dream Liquid version. It's described as having an "Airbrush Finish" and it's one of the few advertising gimmicks I'd actually agree with. It's soft, light and incredibly creamy with practically perfect coverage. My only advice is that you need to give it a few minutes to set before applying the rest of your make-up - and for best results give your face a dust of translucent powder to finish. But once that's done, I've found it lasts, doesn't run, and stays bright and clear. If only I could find a way of stopping my eyeliner from running, I'd be set. As much as I'd like to say I've been paid a bucketload by Maybelline to say this, I haven't. But I'll be buying this foundation again - it ranges in price from $20-$23 depending where you go, so it's a nice affordable bit of gorgeousness. Now - for those of you who went off to watch the Deadliest Warriors clip - how bloody unbelievably awful yet awfully good is it??!!? I find it also covers blemishes - giving a nice even skin tone. It's a good thing you explained what it was we were looking at. Sod Make-up! The Deadliest Warriors tv show would have to be the most amazingly good bad television I have ever seen! I was using Maybelline for a long time and a friend put me onto Napoleon stick foundation and I fell in love (as much as you can with makeup). It's a little pricey at $62 but it gives a smooth even finish and can be worn without powder (however if you are a powder addict, I suggest you only use a little with this foundation). It comes in many shades and even for those with dark skin, which foundations rarely do. Now I won't go back to any other brand. And well you know what they say about Maybelline - maybe it's Maybelline, maybe it's Photoshop! !